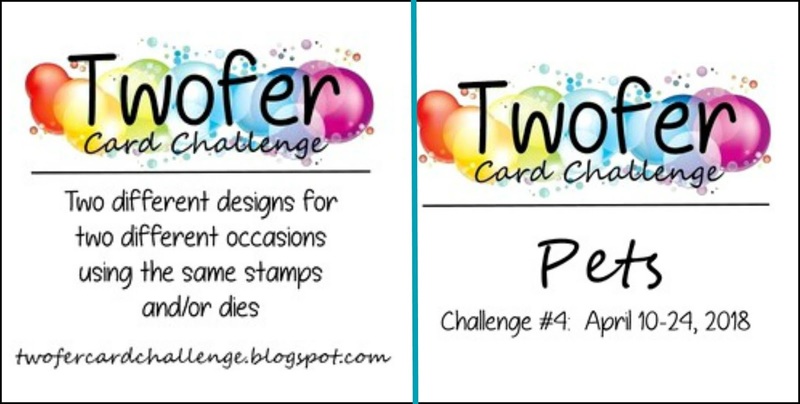 There is no point in having a cup of coffee with you today because a certain little furball is beyond becited for me to show you the cards we made for the new challenge at Twofer Card Challenge where the prompt word is PETS! The coordinating stamp and die I used is from "Hammie Coffee and Tea" from Your Next Stamp. It might look like I used two different hamsters from the set, but no, I used the same one, honest. The stamp artist gave him two deliriously happy closed eyes (as one does when eating a cookie!) and I covered them with googly eyes for the Christmas card, where I also covered the cookie with a Christmas light bulb. Other than Hammy and the "Happy Birthday" sediment, all the fun elements on this birthday card are from a NBUS Technique Tuesday set. I'm sorry you can't see all the winking and gloss on those bright red old-fashioned whisk handles and blender parts, but I think you can see the schparkle on the Mix Things Up sediment. Next to helping out in the Playhouse, Hammy loves helping out in the kitchen best, especially when he gets to pick the schprinkles for the cookies! 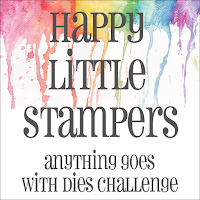 Happy Little Stampers: Anything goes with dies for April. 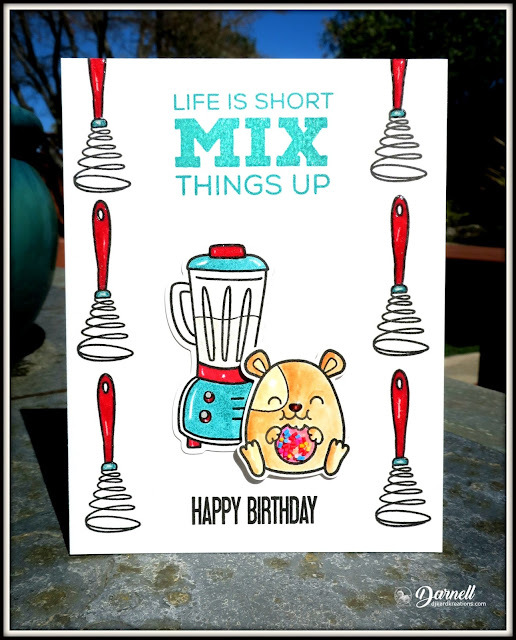 Simon Says Stamp Wednesday Challenge: Happy 9th Birthday! Here Hammy is showcased in the center of an MFT Peek-a-Boo die. I'm not gonna lie, he is loving the limelight ... er, the orange light! The string of Christmas lights and the sediment are also from Your Next Stamp. Just like the birthday card, both strings of light are winked and glossified. The Holly and Ivy Christmas Challenge: Anything goes Christmas. Jingle Belles: Orange you glad it's Christmas? Photo inspiration. I would love it if you shared a photo of your pet in your post! Of course, I had to share mine or there would be no living with him!! Two brilliant cards featuring the stunningly handsaome Hammie! No surprises, just brilliant. How lucky are you to have the perfect stamp for your hammy pet! Time for me to looks for a "Sugar" stamp! Thanks for the wonderful inspiration Darnell! Hammie - a stamp set named after him - he'll be such a diva! (Well even more than he is now!). Two great cards Darnell - made me smile - particularly the googly eyes! Super fun cards and made me smile with 'MY" cup of coffee this morning! Going to be a fun challenge!! 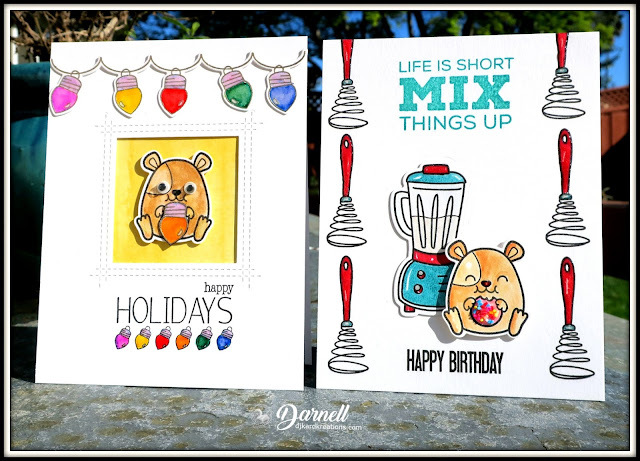 Adorable cards, Darnell! Love your use of Hammy stamps and I can see how they are the same image, oh so cleverly modified to have two different looks. Oh golly, I love the old fashioned whisk image, too. Excellent work on these cards. One of these days I hope to participate in your fun challenge. Unfortunately these days I'm wrestling with carpal tunnel in my right wrist and can't even craft. :( I sure can enjoy what others are creating though and am delighted at your inspiration! Have a great day! Hugs! Hammie must be very pleased to be the star of this challenge! He looks like he is really enjoying his cookie! I love the googly eyes and Christmas lights on his Christmas card! I'm going to have to dig deep for this one! Of course Hammy would be the star of your 'pet' cards, Darnell. Nothing else would do. I can just see his tirade if you used anything else but him and I love the little scenes you put him in. There would be no question that Hammy would be the star of this challenge. To have a stamp set named after him must have put him over the moon. The cards are adorable adding the google eyes made him look so different. Wait till I tell Molly the challenge this month is pets. I wish she helped me out like Hammy does for you, but alas, I'll have to go it alone. 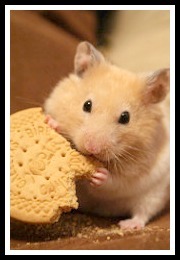 I love that picture of Hammy eating the cookie. Hi Darnell, Loving the cards with Hammy on. Oh Darnell, so good to see Hammy haming it up on your delightful cards. These are both clever & cute, Darnell! Just perfect, Darnell! As soon as I saw this fortnight's prompt, I was wondering about which hammy stamp you would be using LOL. Hammy must be so pleased you thought up this prompt and made him the star on your twofer. I can see why Hammie is delighted with this Twofer challenge...it is soooo him. I can just imagine how meticulous he is adding sprinkles to cookies and helping to decorate for Christmas. Your cards depict those activities so well. Seriously, adorable. Love all the little touches and the coloring. Fantastic Twofer card set. I love the cute little hamster image too and you used it perfectly both ways. I am working on a project but maybe I can sneak in a Twofer soon. Ohh!! Darnell!!! I'm officially melting with delight here!!!!! What an adorable, fabulous, beautiful, charming, sensational pair of cards featuring the one and only HAMMIE. Awesome designs on both cards, fantastic coloring and an overload of cuteness!! Thank you for this challenge, I'm going to see what I can come up with, now that I have the rules perfectly understood, LOL!! Both cards are so adorable Dolly!! Love the shimmer from your Mix it up sentiment and can see the glossiness on the whisk handles. Great highlighting with a white pen, BTW! :) Look how happy Hammie is eating his cookie. Yummy!! And then the Christmas card. Sweet! Great way to make a small change by adding the googly eyes, and Hammie holding a Christmas bulb. Love the colours of the rainbow ... so bright and fun! Two brilliant cards Darnell, love the cute images, not as cute as the original though, grovel, grovel. Love all the white space and the super background images. Awww.... adorable Hammie's cards! Both so fun and striking! Great works! Love the sparkle, and that lightbulb string looks just amazing with the glossy! Oh my gosh two darling and oh so fun cards! I love each one .... the lights looks amazing up close! 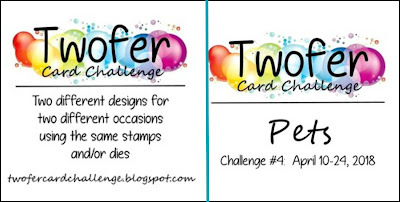 Ok so make two cards using the same stamp but in two different ways? Two cutie - pootie cards! Love both of them Darnell! Oh how I love both these cards! And that you featured Hammy, as you should. I really really mean to play this time around! OH that Hammy, he sure is a dapper little dude! These are so much fun Darnell. 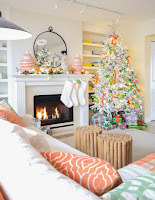 I like all of the little red handled whisks and the brightly colored Christmas lightbulbs. These are both adorable! I love both your cards, Darnell. Hammy is quite an inspiration! I think I have an NBUS stamp set that may just work for this challenge. I hope to find the time soon to ink it up! TWICE! as adorable!! You did Hammy proud my friend! I just realized that it's the 10th, and flew over here to see what your prompt is for April...to my happy surprise the first thing I see is 'Hammy'!!! I LOVE how you cut and pasted, masked and glued and colored and glossy accented to create your awesome cards, Darnell! You have really inspired me with these adorable cards, and I can't wait to play along! Your cards for this months prompt are mega cute, no wonder Hammy is all excited! He would not have forgiven you had you not chosen a hamster stamp, I imagine. It was very clever how you gave him a light bulb to hold on the Christmas card and those googly eyes are so fun! And boy, how happy he looks holding his colorful cookie on the birthday card! Super adorable! Darnell, these cards are a delight - they make me smile. Hammy is cute as can be. I love how you made him look so different with the googly eyes. You are so clever to have changed out what he's holding in his hands, too. I don't know that I would have thought of that. Cute cards, Darnell! I love animals! Sorry I have not been playing in your challenge! I find it hard enough some days to make one card, let alone two, but I love seeing the inspiration. You and your team are so talented! Always love your twofers - especially these - I know Hammy surely was Happy. Love your inspirational stories with Hammy and what he likes. Great cards and one ahead on your Christmas Cards. Ack! These are two of your cutest cards EVER! There can't possibly be a hampster stamp you don't have, can there? I just love how bright and cute and happy these are. Dang, the accessory stamps and dies you used on both cards are just amazingly fun. Glad I don't have to pick a favorite. You did a very creative job of changing the look of the hampster, yet so easily with the googly eyes and the Christmas light. I'll put my thinking cap on. I love playing just for fun! Now that's what I call cute. Adding the googly eyes was an inspiration. Hugs Mrs A. These are spectacular!! I LOVE that you used Hammy-though what other pet would you use, right? The mix it up is just so fun with the little blender. The fun, colorful cookie is the perfect touch. The holiday card with Hammy holding the light is just so cute. Such happy little cards!!! Hammie must be in heaven being the star of a Twofer! Such cute cards! Love the way you made him look different with the addition of the googly eyes. Great cards - so much fun! Well, aren't you the hostess with the mostest??? Super clever use of that cute stamp... the GOOGLY-EYES are the best!!! These stamps are super cute! I love how you gave him two different looks! Think ypu are so creative in using a stamp in two totally different ways! And got a smile from the moment I discovered Hammy! They both are so cute and fun; I'm sure the recievers will love them! Your Hammy must be very happy to be the center of the challenge cards! Both cards are so adorable, Darnell! I love that you placed the googly eyes and the orange Christmas bulb over the original stamp image to change the look! How clever! The shimmer and gloss looks so festive in both cards! Oh, how cute!! Both cards are adorable with the little Hammy! Love the fun googly eyes, color, and design...so fun! Haha!! Great idea to use googly eyes on the one version of that hamster, just to make the set more versatile. I imagine that Hammy is full of himself after seeing these cards, so here's hoping you were able to rein him in before bedtime! Both of these are so adorable, Darnell! And how clever to alter hammy for the two different occasions. I'm sure Hammy is on cloud nine that you chose the BEST pet to feature. Tell him his photo is adorable too! I love both cards Darnell! And of course Hammy always steals the show. So sorry not to be blogging or even card making that much - life is busy right now. Sorry I'm late commenting - and thanks for coming to play in the Snippets Playground again! How fun! Love your personalized "Hammy" stamps -- quite appropriate! Two great cards, and I sure do see your sparkle and your shine (on the cards, but personally too)! Sooo wish I wouldn't done a second pup card the other day! Super cute cards! I really like this red and blue color combo on your birthday card, kind of retro. And the sweet hammy looks quite different and fun with the goggly eyes. Thanks for having me as a guest designer this month. Darling twofer with the hammies, Darnell - just love the little photo of your sweet Hammy too! All the Christmas lights look amazing on card one and I love the whisks and blender on card two! Thanks for a fun challenge!! I love the bright, fun colors on both cards, Darnell! Sorry for the late comment, Darnell. Your two cards are just adorables and so beautiful to look at! I think it's awesome how you have "transformed" the hamster for your Christmas card - too cute with his googly eyes! Terrific twofer. You can't beat a bit of hamster action. I don't have any pet stamps so I could cheat and just post pictures of my little minxes.